It’s March for Meals week again! And what exactly is this you may ask? The March for Meals campaign has been an annual tradition to bring awareness to Meals on Wheels programs across North America. During the week of March 18th to the 22nd 2019, Meals on Wheels programs collaborate with community organizations, local governments and other committed individuals to deliver meals to seniors and adults with disabilities. Meals on Wheels programs are a vital community support program that rely on volunteers to deliver meals daily. Community Champions help shed light on programs such as ours, which help Meals on Wheels’ clients lead healthy, happy independent lives. One of our Community Champions at Meals on Wheels Ottawa is Jo Buss. She is a jack-of-all-trades kind of volunteer, assisting in the office twice a week, delivering meals almost 4 times a week and really just helping out in any way she can. Jo is an incredibly active retiree, swimming almost daily and cycling as soon as the snow melts! She had heard about the program when her mother had been a volunteer at the Regina Meals on Wheels and decided to try it when she realized she still had extra time on her hands. Since joining five years ago, Jo says it’s the wonderful environment at Meals on Wheels that keeps her coming back. From the interesting and appreciative clients she sees on routes to the welcoming and kind staff at the Meals on Wheels office, Jo enjoys “the feeling of being of use to people in need”. 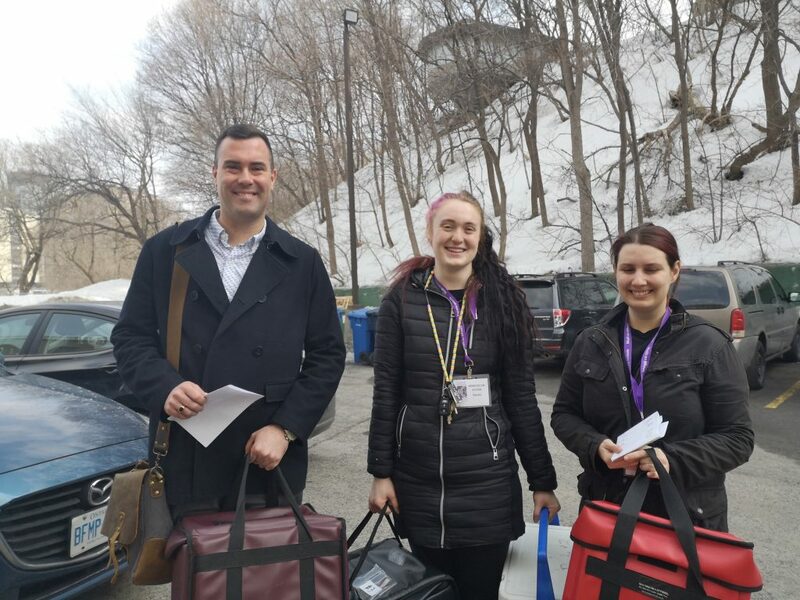 Owen Brady, Regional Volunteer Recruitment and Community Outreach Coordinator at the Champlain Community Support Network, joined delivery team Marika Routliffe and Katie Fantin to learn more about the Meals on Wheels program first hand and meet the clients on their downtown route. Owen’s goal is to highlight Community Champions and help bring awareness to Meals on Wheels programs across Eastern Ontario during March for Meals. Katie Fantin and Marika Routliffe have been delivery volunteers since last fall. When asked what Katie likes most about volunteering with Meals on Wheels, she mentioned “it is a great way to help in the community. We’re university students and the Good Companions Centre kitchen is located downtown which is easy for us to get to, it’s only a two hour commitment”. 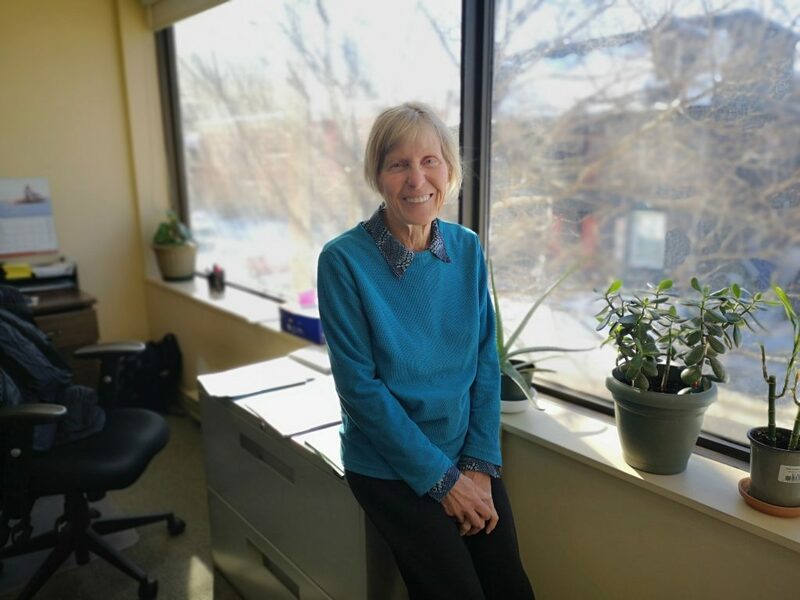 Marika added: “it’s a really nice way to check in with seniors and other members in the community who receive the service, to talk to them and see how they’re doing”. Owen Brady, Marika Routliffe, and Katie Fantin getting ready to deliver meals in Centretown. 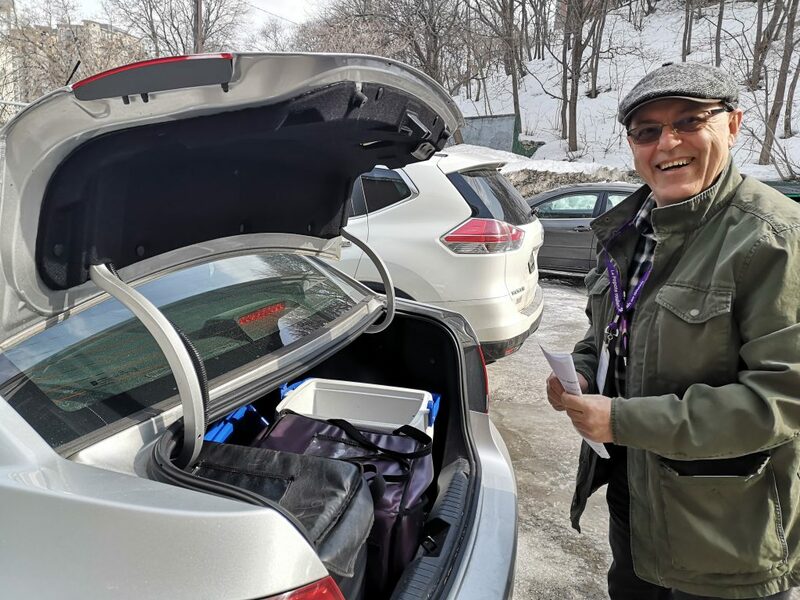 As a volunteer at both the Good Companions Centre and Meals on Wheels, Brian Robertson works both behind the scenes and on the front lines of the service. Helping in the kitchen at the Good Companions Centre, he know what goes into getting the meals ready for delivery by the Meals on Wheels volunteer teams. Two days a week he goes out on delivery and enjoys meeting the clients in their homes. Volunteer Brian Robertson is all smiles as he packs his meals, getting ready for a delivery! Thank you to all of our Community Champions who are so committed during this special March or Meals event and all year long! Why not share why you are a Community Champion for Meals on Wheels? Meals on Wheels Ottawa is always looking for enthusiastic volunteers to join our team of community champions! Both volunteer servers and drivers are needed for meal deliveries from 11 a.m. to 1 p.m. Monday through Saturday. If you’re interested in helping in your neighbourhood, please call Jill Daigle at 613-233-2424 or email her at jill@mealsonwheels-ottawa.org. You can always find more about Meals on Wheels on our website at www.mealsonwheels-ottawa.org.